From a bivouac site for the cavalry and passing units, then Baden-Powell’s fortiﬁed HQ camp and communications post, followed by a Boer laager and a general’s HQ, the site rapidly developed, within a few months, into a 900-man garrison and depot, complete with batteries of guns giving control over the passes of Silkaatsnek and Commando Nek and the all-weather road and the telegraph line between Pretoria and Rustenburg; it was situated conveniently close to the ‘Paul Kruger’ bridge over the Crocodile River. It merited a tented hospital (No 39 Stationary, 100, later 200 beds) from October, serving the garrison, surrounding units and casualties in transit from events in the Western Transvaal, thus saving the trauma of a further day’s wagon ride into Pretoria base hospitals. Not far from the hospital was the inevitable cemetery. The SA War was the last one involving British forces where the death rate from disease (mostly typhoid) exceeded that of warfare. The Garden of Remembrance at Ifaﬁ is a consolidated cemetery, since remains from isolated cemeteries were added in 1972 bringing the total to 129 from 31 different regiments. The cause and date of death for each one named is known. Rietfontein West [i.e. the one west of Pretoria] came to be regarded as the key to the Western Transvaal. There were no further major military incidents in the immediate vicinity. An exchange of words, however, occurred at Commando Nek in late August, 1900. Three British columns almost cornered General de Wet who thought he might try to penetrate Commando Nek on his way south. He sent a message to Baden—Powell suggesting he should surrender, being outnumbered, to save life. BP replied that his Dutch was very poor and he did not quite know whether he was asking him to, or was offering to surrender. De Wet thought better of trying the passage and eventually crossed the Magaliesberg by a difﬁcult and little known ‘baboon’ trail opposite the farm Remhoogte in Skeerpoort. In October 1900 the road from Rietfontein to Pretoria was infested with snipers and had to be cleared. Col Rockfort, RA, took a small party of Dublin Fusiliers with him to deal with a particularly troublesome band of marksman who specialised in harassing convoys. He succeeded in capturing all but one of them. On account of these hazards, instead of supply wagons drawn by oxen, steam traction engines were employed to pull ﬁve wagons at a time as far as Rietfontein. They were much more compact and easier to defend than bullock drawn convoys. Apart from being a centre for clearing the countryside and re-supply of units, Rietfontein was the ﬁrst staging post after Pretoria for convoys going to the next depot at Rustenburg. In December the outward ‘Christmas Convoy’ was attacked opposite Buffelspoort, halfway to Rustenburg, severing communications. This was the prelude to the largest battle in the area at Nooitgedacht a week later. In both cases casualties were brought back to the Rietfontein hospital. In January 1901 the Lincolnshire Regiment took over garrison duty from the Northumberland Fusiliers who, during the last part of December, had built three forts on the hills 2 miles to the South overlooking Rietfontein to deny them to the Boers. In March Col. Archdale took over the battalion. On the 16th the battalion marched out from Rietfontein to Silkaatsnek to a memorial service for their fallen comrades. In June and July they built several blockhouses at Kalkheuwel extending the telegraph line to Signal Hill, visible from Pretoria and Johannesburg. A blockhouse was also built at ‘Orange Grove’ overlooking Klipspruit farm on the Broederstroom road. On a morning in July two companies of Lincolns were sniped at ‘Scrubies’ Farm without casualties. The Scruby family still live in the area and their scorched, bullet—ridden barn has been preserved. 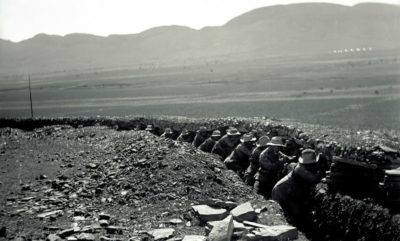 Only after August 1901 was the general fort-building policy commenced along the Magaliesberg and its passes; the Royal Engineers constructed them at a cost of £48 each. About this time Capt Rice, RE, designed a cheaper fort [£16] of round or hexagonal shape, with double layers of corrugated iron on a wooden frame. Small stones ﬁlled the intervening space. Prefabricated loopholes were provided; the lower sill had a hole into which sand could be poured to prevent loss of protection due to settling of the stones. A very good example was placed atop the Witkopje on Silkaatsnek. Vulnerable to lightening, a conductor can be seen on photographs taken of it. Two graves at Rietfontein are a result of lightening. The Lincolnshire regiment occupied the Magaliesberg forts for the remainder of the war.